Shrinkwrap recycling starts in the fall: While many boaters know that shrinkwrap is recycled in the spring, installing shrinkwrap in the fall also generates waste material. 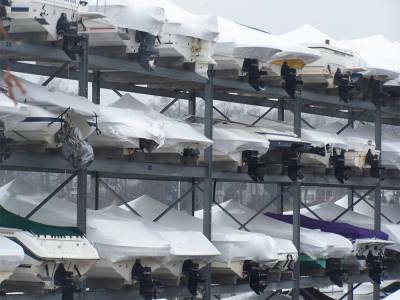 Ask your marina or club to set up a recycling program now to recycle the scrap leftover from covering boats. Shrinkwrap should also be separated from other trash. Putting it in a dumpster that is open to other refuse makes it unusable to recyclers. In addition, anytime shrinkwrap is recycled it must be "clean": ropes, tie-downs, zippers, or plastic vents should be removed or else the wrap won't be picked up by recyclers. Know your antifreeze: Be sure to winterize the engine and freshwater system with safe, non-toxic "marine" or "RV" antifreeze that contains propylene glycol. This fluid is most often a pink color, but can also come in other colors (such as purple, orange or blue) that offer increased freeze protection. Never use automotive antifreeze (ethylene glycol), which is toxic to the environment and can cause serious illness if used in fresh water systems. The fluid bonanza: Winterizing a boat's motor and outdrive creates quarts of waste oils. Collect and save these fluids for your marina's or local gas station's oil recycling program. It's okay to put all of these oils in the same container but be to sure ask where it should go - placing the container simply on the ground near the collection tank can put a marina at risk of fines (and can be easily spilled). Also don't forget to have a supply of absorbent materials to handle drips when winterizing the engine, outdrive or gear cases. Go for the washpad: If you are going to pressure wash you own boat, ask your marina where the best place is. Many marinas have washpads designed to prevent contaminants from entering the water. If none is available or if you are at home, use a tarp under the boat to capture any debris. Also try to use an environmentally friendly boat soap when washing down the topsides before you put her away. Try a clean marina: Looking for a new marina or boat yard to haul and store your boat this winter? Try selecting a certified "clean marina" that can help make green winterizing easier. Clean marinas follow established environmentally friendly practices and there are programs in over 20 states. To find a clean marina near you visit: //www.boatus.com/foundation/cleanwater/marinas.asp.